Now will you buy one? 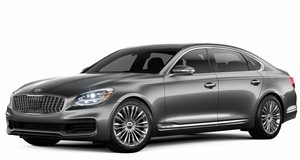 With the K900 struggling to sell, Kia has tried to tempt buyers to at least consider its full-size luxury sedan by creating a special edition model styled by LeBron James. Following a recent teaser, these images come from the Cleveland Auto Show where the “King James Edition” K900 is on show. Apart from a cool two-tone red and black color scheme, the car hasn’t changed. The blacked-out grille and badges are nice touches, as are the rims, but we’re not sure if that will be enough to tempt buyers to choose this over a similarly priced BMW 5-Series.